It’s no secret that Chica and love supporting individual artists and small business owners. Some of the gear used on the Appalachian Trail and our Camino de Santiago hike were hand made by seamstresses with Etsy stores. 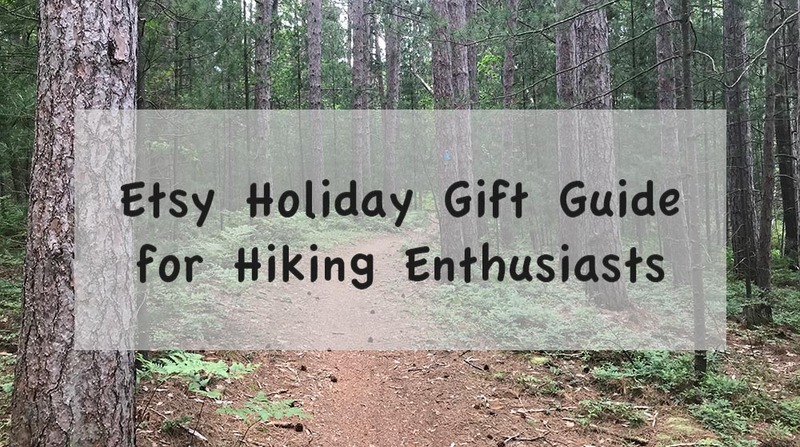 For this holiday season we have created a guide for our favorite hiking related Etsy shops. These gift ideas make a great stocking stuffer of gift for family and friends or, if you are like me, make a wonderful purchase for yourself. 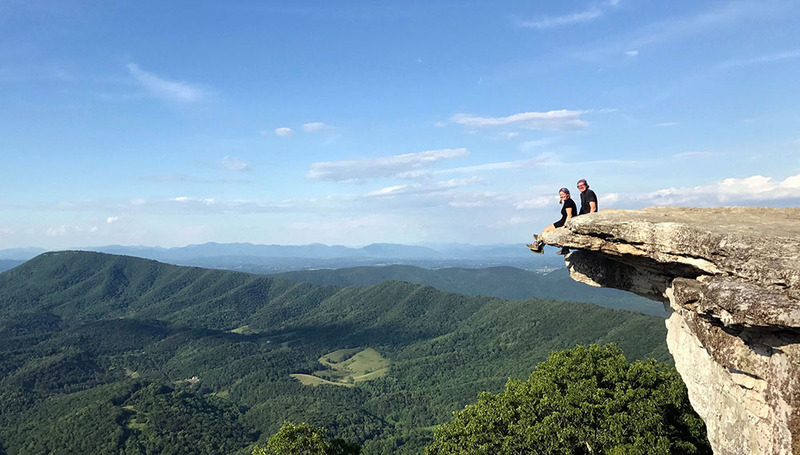 The Yearn More idea was created when owner Patrick Leddin took his son and his friends on a 10-day Appalachian Trail hike. The trip was a success and Patrick wanted to commemorate the trip. He made plaques from cut logs for each of the boys. They proudly took the wall hangings off to college and encouraged Patrick to make the products available to others. 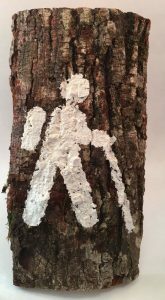 In the Yearn More Etsy store you will find the original log plaques, stenciled with various hiking emblems, custom hiking stickers and posters, and more. Each item is handmade or of original design. Buy with confidence, the store has a perfect five star ranking. We are huge fans of Justin’s UL water bottle holders (and other products). Just see our grizzled selves in the photo to the left. These holders on the front of our packs not only made our water easily accessible (as opposed to the notoriously annoying side pockets on most packs) but they lasted our entire thru-hike. That mountain in the background of the photo is Katahdin and our holders are still intact. Incredible craftsmanship. In addition to multiple sizes of the shoulder strap holder, Justin also makes ultralight cellphone holders, stake bags and more. All of these products are small, super-light, and inexpensive and would make any gift recipient smile. All five stars for Justin’s UL. The artist that create the gems found at Wander Arts Crafts has a bachelor degree in Fine Arts and was the Master Decorator at Emerson Creek Pottery in Bedford, Virginia for 9 years. 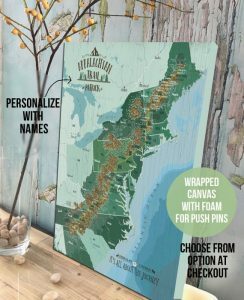 She pairs her skills and talent with a love for the outdoors and Appalachian Trail to create one of a kind art. The store offers hand painted products along with mugs and stickers based on Melinda’s art. Her shop is favored by over 1100 people and she has 104 (all) five star reviews. For our Appalachian Trail thru-hike Chica wanted to wear gaiters. This product helps protect from dirt or the errant rock finding its way into the shoe. Through the Appalachian Trail: Women’s Group she found out about Ultra Gam. She loved the design and price so bought a pair. 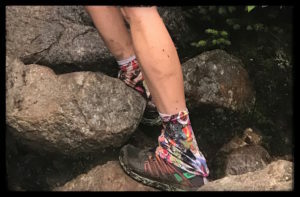 Needless to say the product served her well as she trekked 2200 miles over 179 days each of which the gaiters were put to the test. They passed, with flying colors. In addition to gaiters, Ultra Gam sells custom cycling sleeves and headbands. The store has sold over 4000 products and has all five star reviews. There is something magical about holding a handcrafted mug in your hand or utilizing other custom pottery. Clay Mason Studios makes a variety of mugs, bowls, clever kitchen items, and even piggybanks. Our favorite is the custom large round trail ceramic mug. 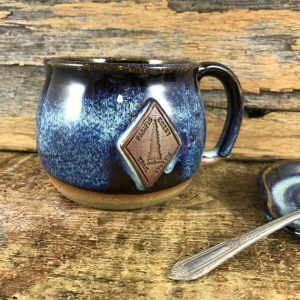 Perfect for a gift or for sipping your own coffee on a cool mountain morning. Clay Mason Studio has over 500 (all) five star reviews. I love art made from simple materials, it is naturally natural. The Scrubby Pine handcrafts simple jewelry that immediately summons up the outdoors. 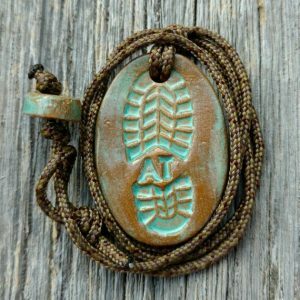 The stamped clay pendants combined with paracord make a wonderful accent to any outdoor pursuit. I love the bootprint pendant with the subtle “AT” stamped in the middle. The store has over 300 (all) five star reviews. And the art is priced perfectly. 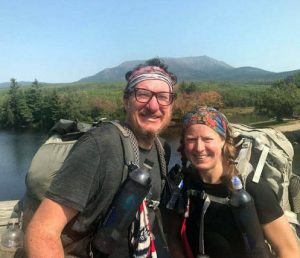 One of the things that helped our moms feel comfortable about our Appalachian Trail thru-hike was the ability to follow along with our journey. We had given each of them a paper map of the trail and little cutouts of us to move as we made our way northward. I wish I would have known about World Vibe Studios then. For just a bit more money we could have had an AT map printed on canvas (with our names) and backed with foam so that pins could be placed on it. In addition to trail and National Park maps the company produces outdoor related t-shirts and other gifts. Over 1500 (all) five star reviews can’t be wrong. 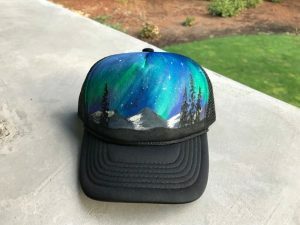 This artist paints beautiful, hiking inspired, products. My favorite are the hand painted trucker’s cap. There are also paintings on barn wood, pallets, and even a maple leaf. 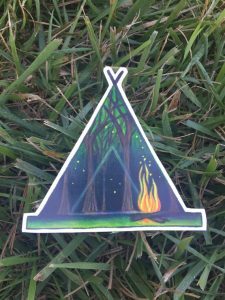 Other Bitter Sweet Canvas products can be found as well, custom stickers, Christmas ornaments, and magnets. That wraps up our round-up. 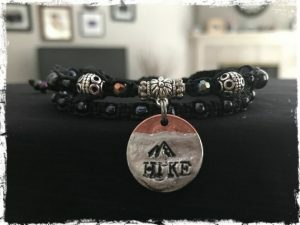 We wanted to promote others’ work, but I would be remise if I didn’t remind you that Chica has her own custom hiking jewelry on Etsy. She hand knots, solders, and stamps all her jewelry, Check out her shop Chica’s Arm Candy.